Now you can carry your passion for USA soccer in your back pocket everywhere you go. Introducing the soccer wallet, made using real soccer ball material. 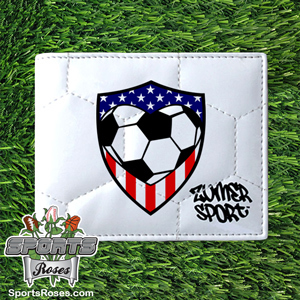 The outside of this durable soccer-themed wallet features hexagonal soccer stitching and a USA soccer heart crest design. The inside of the wallet boasts a flip out ID holder, 9 credit card slots, and a plastic holder for photos. 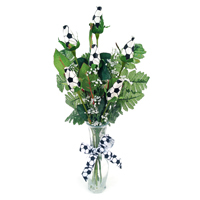 We can also personalize the back side of the wallet with your favorite soccer player's name and number. Choose from 3 different colors for the number (Red, Black, or Blue). 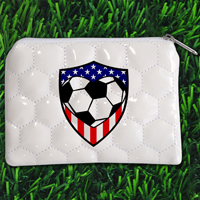 The USA Soccer Wallet is perfect gift for him - soccer fans, players, and coaches. Optional Customization: Add a player name and/or 2 digit number printed with athletic-style font in red, black or blue print. 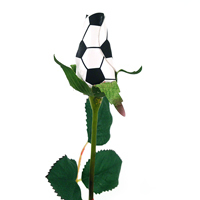 The rose with petals handmade from real soccer ball material. Blooms forever! Add a matching gift for her!